This red trim wedding gown is perfect if you prefer a simple wedding dress. Its simple design will leave you comfortable throughout the wedding. The trim is designed elegantly in the shape of a heart or love to portray the importance of the day. It also has some great minor crystal details on the bust area. Besides that, It has some small straps and most importantly it will look more fabulous when worn as a strapless gown. A red trim at the bottom is present too plus a semi-cathedral train which is easily adjustable because of a button at the back. It has a zip-close up at the back. It is made with satin fabric and chiffon for the trim. A tiara addition will enhance the look, therefore grab one from us for free with your rented gown. The bridesmaids can wear any style but a red theme on their dresses will reciprocate the gown. The flower girls can also wear white with red details. 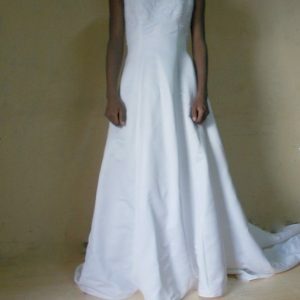 Below is a quick view of the features of the gown. Below is how other brides look in it. View more A-line gowns in the products categories. Also, contact us in case you need sizing guidance, and don’t forget to follow us on Instagram for more dresses and other great products. Finally, this red trim wedding gown is certainly perfect for weddings with a red carpet theme. The bride will look nice coming from a limo or her vehicle and straight into the red carpet. Experience this by renting it today due to the fair price.